A modern rugged design providing the rigidity required for accurate component welding. 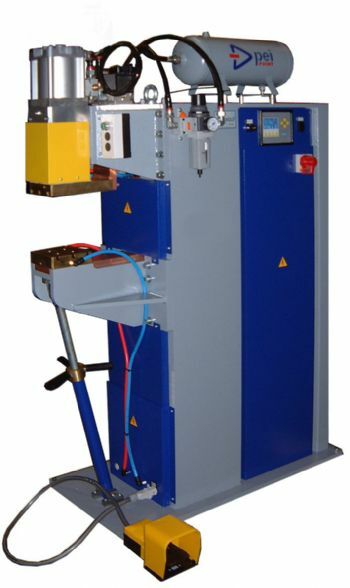 Standard machine supplied with platens. Electrode holders and mounting adaptors available for spot welding applications. Lower platen adjustable for height. Fitted with bracing strut for rigidity. High-lift cylinder fitted as standard. Adjustable High-lift or High-force cylinders available to order. Main transformer, platens and electrode holders fully water cooled ensuring maximum output and consistent performance at high duty cycles. Rigid top arm with air cylinder acting directly on top platen ensuring linear movement and fast response. Supplied with foot pedals and concomitant hand push buttons (with key or switch) for safe operation.